Available for rental, lightweight, portable and simple to operate, our underwater U/T systems are built with the customers’ needs in mind. The system has full topside control including DAC, Echo-Echo and data logging. 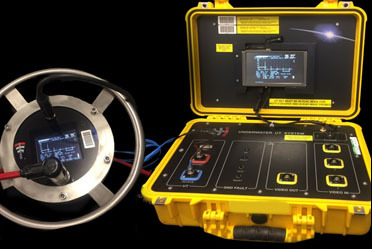 A choice of flaw detector is supplied (Epoch 4B, 4, XT or 600) along with a Twin 0 degree 5 MHz compression probe and a full set of single crystal angle probes (45, 60 & 70) with wet mateable subsea connectors. The Underwater UT Set is very user friendly, enabling the changing of probes subsea. The topside control unit features an Archos 7 Display which can be used to mirror the UT Set image, or display a combination of images selected by the operator. The system receives up to three additional camera or video inputs which are displayed on a split screen with the option to record direct to PC or USB. Rated to a depth of 250m, the subsea head is connected to the topside unit by 250m of cable with the topside unit contained in a 1500 pelicase. The operator benefits from an ergonomically designed and neutrally buoyant diver held subsea head for thickness gauging, flaw detection and weld inspection.